We make dal everyday but do you ever feel that dal at a restaurant tastes special? How would you love to get that taste in your dal at home? Knorr Chef’s Dal Masala is made with the perfect combination of ground spices to get the restaurant-like tantalizing taste, attractive colour, perfect consistency and appetizing aroma in your home cooked Dal. 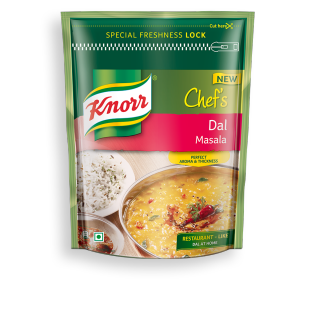 Knorr Chef’s Dal Masala gives your home cooked dal the restaurant-like taste. What's in our Dal Masala? 1. Get Restaurant-like Dal at Home 2. Made by Knorr Chefs 3.With 'Special Freshness Lock'- Keeps your spices fresh for longer 4. With Perfect Aroma & Thickness 5. With Knorr Chefs Masalas, you are the Master Chef of your kitchen 6. Chef's Tip: Garnish with fried garlic, fried chilies and coriander leaves. Serve hot with Rice or Roti. 1.In a pressure cooker, boil the toor dal in about 2 1/2 Cups (400 ml) of water along with turmeric. 2. In a separate frying pan, fry jeera seeds in the oil. Add chopped onions and fry till light brown. Add chopped tomatoes, ginger-garlic paste, red chilli powder, turmeric powder and salt. Cook on low flame till oil separates. 3. Add the boiled dal along with 1 1/2 cups (200 ml) of water and bring to boil. Add 1 tbsp (10 g) of Knorr Chef's Dal Masala, mix well and cook for 2-3 minutes or till the Dal is thick. Serve Hot!